The "Sipeed M1w Dock suit" (see Fig. 1) includes in the box: a 2.4 inch LCD, a OV2640 camera, two pinheaders, a USB Type C - Micro USB adapter and a WIFI antena. This means, you can start directly with the demos, which are e.g. image recording, face detection etc. I almost forgot to mention: the board can be programmed using MicroPython! This means, the included demos are "python" based examples. (*) There are two versions of this suit. The M1 and M1w, the last one supports WIFI. As I mentioned before, the board is MicroPython compatible, which means, it has MicroPython installed out of the box. Unfortunately, the PyMakr plugin is not 100% compatible yet. They are making some changes on the file-system, and there are still problems when uploading the files to the board. This means, you can use Visual Studio Code (VSC) with the PyMakr plugin to run MicroPython files on the board, but not to upload them. Download files is also possible. If you need some help with MicroPython, a tutorial is available here. This also includes information about the PyMakr plugin. Visual Studio Code (VSC) can be also used to program the boards. To upload the files, you can use uPyLoader. 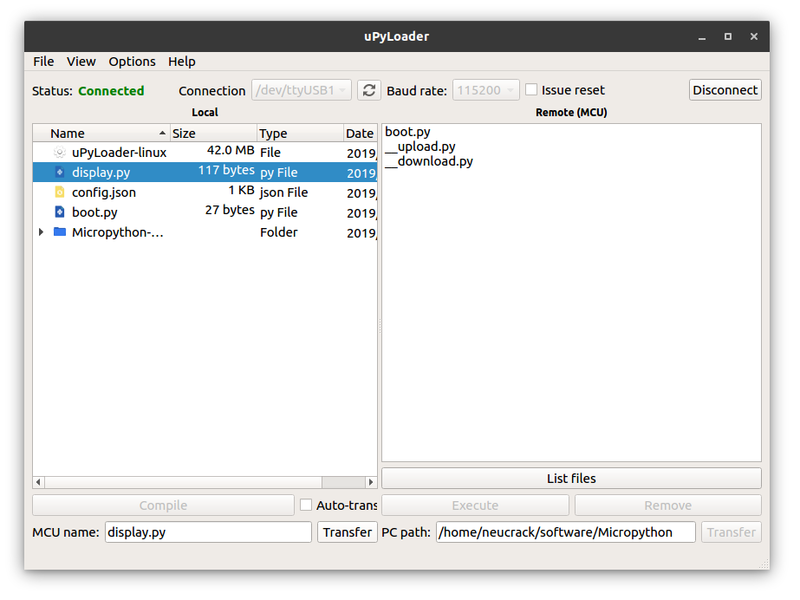 uPyLoader (see Fig. 2) is an open source software that allows you to easily connect to the MAiXPy and upload, download, and execute files. However, the connection with the MAiXPy is far away from stable. The upload is usually interrupted several times, and you need to retry a lot. Select the serial port and click the Connect button to connect the board. Go to File->Init transfer files to complete the initialization. This creates two files in the board, __upload.py and __download.py. Select the file that you want to upload, and Click on Transfer. but as I said, you need to retry a lot. The kflash tool allows you to upgrate the firmware of the MAiXPy. maixpy_v0.2.4_*_with_model_at_0x300000.kfpkg: integrates the face detection model at 0x300000 of the flash, which can be loaded using kpu.load(0x300000) (see next section). Just copy the above code inside a file on VSC, and press the Run button of the PyMakr plugin. The result can be seen on Fig. 3. Here, I spend some words about the Seeed Studio. I am positive impressed about the bazaar. They are getting always the newest technology to sell. They are an excellent IoT enabler. Now, they are partners with Coral, Nvidia and Sipeed. That's very impressive! You should take a look at its bazaar: Seeed Studio. It is very simple to buy things there, they accept PayPal and the shipping time is very short (in this case, just 7 working days with standard mail - faster options are also available). The MAiXPy is a "nice to have" board. It can be programmed using MicroPython and it allows you to do some low power AI at the edge. The camera to display data-transfer works really fast, and almost no delay can be perceived on the face recognition application. The documentation is available here, and in the last months, it has been really improved. the filesystem problems need to be resolved. The file upload functionality is not working at all, and makes very difficult to use the board for developments. It should be compatible with PyMakr, then it will be possible to program the board using either VSC or Atom.io. I didn't find any information about wi-fi. There is neither a network package nor a machine.WLAN class. I am a little bit confused. I will be "playing" with the MAiX Dock during the next days, and upload some extra results. Last but not least, I want to thank Elaine from Seeed Studio for the support when I contacted her to evaluate these boards. Thank you!